Metabolism can be described as life sustaining biochemical processes, including growth, reproduction and maintenance, that occur within the cells of living organisms. 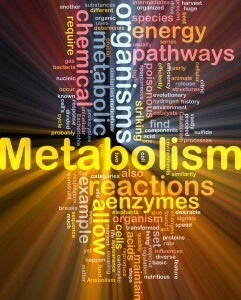 The term metabolism actually includes two categories. These are catabolism, the breakdown of food molecules into smaller components to obtain energy, and anabolism, the synthesis of energy to construct components of the cells. Our body weight is the result of catabolism minus anabolism, or the amount of energy our bodies produce minus the amount of energy we expend. Energy formation is a vital component of metabolism and nutrition is the key. In other words, we are what we eat, how much we move, how much we rest and how well our bodies function. The number of calories your body needs to carry out basic functions is known as your basal metabolic rate (BMR). Your BMR contributes to 50 – 80% of your total energy use. Total lean mass, especially muscle mass, helps to regulate the BMR, which is why it’s important to maintain muscle mass when trying to lose weight. At rest, the energy expenditure of your muscles is about 20% and this increases exponentially during physical activity depending on how long and how hard you exercise. Energy burned during exercise is the only form of energy expenditure you can control, so take advantage and start moving more if you want to lose or maintain your weight. To lose weight, you need to eat fewer calories, creating an energy deficit, and increase the number of calories you burn through physical activity. Although it may be tempting to blame weight gain or failed weight loss on a slow metabolism, excessive weight gain from a medical problem, such as Cushing’s syndrome or hypothyroidism, is rare. Weight gain is most commonly associated with eating more calories than are burned. Excess energy is stored either as fat or as glycogen. Because metabolism is a natural process, it slows when you don’t eat enough and conserves energy for survival. Eating too little can slow your metabolism by as much as 20%, so it’s important to eat enough of the right kinds of foods each day to keep your metabolism humming. Take your work out to the next level. If it stands to reason that a sedentary lifestyle can sabotage your weight loss efforts, exercise can activate your muscles, increasing your average daily metabolic rate. Simply put, muscle maintenance takes energy and burns calories. High-intensity aerobic exercise can rev up your metabolism and increase your resting BMR. Ramping up your intensity for 30 second intervals while exercising helps you consume more oxygen and makes your cells work harder to burn energy. Stay hydrated by drinking a glass of water an hour before or after every meal or snack. The body needs water to process calories. Dehydration can cause a drop in body temperature and can contribute to an ineffective metabolism, causing your body to store fat as a way to maintain the ideal temperature. Water helps to mobilize fat stores and dehydration signals fat storage. Use energy drinks wisely. Some ingredients, such as caffeine, can speed up the amount of energy your body uses and give you an endurance boost while you exercise. Drinks that contain amino acids, such as taurine, may help boost the metabolism and burn fat. Limit how much you consume as overconsumption can cause high blood pressure, anxiety or sleep disruption. Eat to maximize metabolism. Small frequent meals help to keep your metabolism steadily burning calories. Studies show that eating a small meal or snack every 3 – 4 hours burns more calories than eating large meals with many hours in between. Eating more frequently can give you increased, longer-lasting energy and may keep you from overeating at meal times. Your diet influences both mood and metabolism, giving you increased energy or making you feel sluggish and tired. Foods high in sugar and saturated fats and low in fiber and water content can slow digestion and lead to weight gain-promoting insulin spikes. A diet consisting of whole grains, fruits, vegetables, lean proteins, legumes, and healthy fats promotes longer-lasting, stable energy levels, aids digestion and muscle building, and supports healthy weight. Lights out. Too little sleep may cause you to lose significantly more lean tissue and less fat. Chronic sleep deprivation is linked with weight gain, reduced activity and lack of energy. Lost sleep can affect the secretion of cortisol, a hormone that regulates appetite and can lead to impaired glucose tolerance, a risk for diabetes. Be patient. Raising your metabolic rate takes time and patience. Three months is a reasonable time frame to expect to see real changes. The impact of foods on the metabolism is relatively small compared to what you need for sustained weight loss but remember it’s a matter of input verses output. To create a lean, mean, calorie-burning machine, get and stay active and build muscle. Turn off the TV and get off the couch. You can’t build muscle and burn calories by watching others play sports. You need to be active too or your metabolic rate will take the hit. Move as much as possible during the day to increase calorie burn and eat enough healthy calories to keep your metabolic rate at optimal levels. Meta-28 Protein by Metabolic Maintenance – With diet and exercise, Meta-28 provides support to a healthy weight management program by helping to control appetite, boost metabolism and promote metabolic balance. This is a vegetable and grain sourced, high-protein supplement fortified with over 20 essential vitamins and minerals. Glucose Metabolism Support by PhysioLogics – This product supports a holistic approach to overall energy metabolism with a scientifically based formula that contains natural herbs and herbal extracts, essential vitamins, and minerals. Metabolic Xtra by Pure Encapsulations – This product provides a powerful combination of nutrients to support healthy glucose metabolism and insulin-receptor functioning and signaling. This entry was posted in Health & Wellness, Home and tagged Glucose Metabolism Support by PhysioLogics, hypothyroidism, Meta-28 Protein by Metabolic Maintenance, Metabolic Xtra by Pure Encapsulations, metabolism, Professional Supplement Center, supplement, vitamin, Vitamins and supplements, www.professionalsupplementcenter.com. Bookmark the permalink.